If you are lucky enough to be in Paris at the moment and you are already sick of the Louvre then head over to the MiliPol 2011 Exhibition at the Paris Porte de Versailles Exhibition Centre about 30 minutes by metro from the museum. On hand you will find around 1 thousand exhibitors from around the world showcasing their products and services for Internal State Security. You will want to key in on the booth #1G 140 where you will find the company Uni & Forma. They are a Slovenian clothing manufacturer that has designed a very interesting Sniper Garment System, and will have it on hand in the PenCott-GreenZone Camouflage™ from Hyde Definition. The main focus of Uni & Forma is producing clothing for the Slovenian military, as well as law enforcement, and other internal public safety organizations. 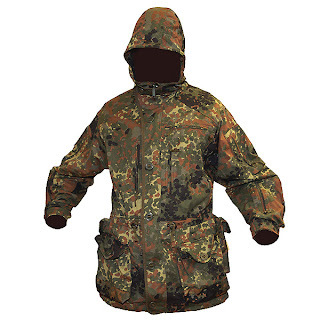 You can view full details of the 3-ayer Sniper Garment System at UFpro.si The outer layer of the Sniper System is seen here with the Jacket in German Flecktarn and is produced with a NYCO material and Cordura Nylon reinforcing key areas including the elbows.